When you are ready to purchase a new car, truck, or sport utility vehicle (SUV) in the Hardeeville SC area, O. C. Welch Ford Lincoln Inc. has been faithfully serving prospective buyers from all walks of life since 1978. Our expansive selection is always stocked full of popular Ford trims and luxurious Lincoln models, as well as used and Certified Pre-Owned automobiles by a wide variety of well-known automakers. In addition to our huge inventory, people continue choosing O. C. Welch Ford Lincoln Inc. over all the other nearby dealerships because we create an inviting, family-oriented atmosphere based on transparent sales, honesty, and a genuine dedication to helping every customer find the vehicle that fits their lifestyle perfectly. 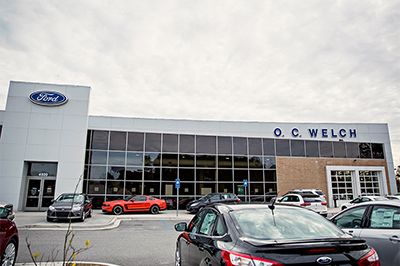 Every facet of operations here at O. C. Welch Ford Lincoln Inc. centers on making you feel comfortable the moment you step onto our showroom floor and courteously assisting friends, neighbors, and fellow residents. We are proudly active members of this wonderful Hardeeville community, from spotting animals in the drive through Savannah National Wildlife Refuge and enjoying outdoor activities at Sergeant Jasper County Park to visiting Golf Club at Hilton Head Lakes for a round. In fact, Mr. Welch is a previous recipient of Ford’s Salute To Dealers award that honors heartfelt community involvement, which includes supporting the 200 Club of the Coastal Empire. You will never look at car buying the same again after you meet with our tight-knit team of automotive professionals and drive off completely satisfied.